Sea Caves can be found at the following locations and are listed from most impressive to least; Devil’s Island, Meyers Beach, Sand Island, Romans Point, Madeline Island, Red Cliff, Stockton Island, Outer Island, Ironwood Island, Cat Island, Bear Island, and Chequamegon Bay. You can expect other paddlers at Meyers Beach. The other sea cave locations you will have mostly to yourself. You will need waves of 1.5 foot or less to enter the sea caves. Devil’s Island: The hardest to access and is really only accessible by boat if you want to get out there and back in a day, but it has the best caves. Devil’s Island is the most exposed to wind and waves of all the sea cave locations. Sand Island: Much closer than Devil’s and can be accessed by kayak in one day. Sand Island has more caves than Roman’s point but not as many as Meyers. Sand Island is a bit shorter but much more intricate stretch of caves. There is the added bonus that they are on an island and the 2 mile open water crossing keeps the crowds down. You rarely see motor boats at these caves. The crossing to these caves are dangerous, you are exposed from every direction, even a South wind can create waves and white caps by the time you are half way through the open water crossing to Swallow Point. Meyers Beach: Not as crowded this year as in the past few years, sometimes you have to wait in line to get in to a cave, but they are still an awesome experience. The caves are amazing at Meyers. Must be more than 50 lbs to paddle at Meyers. Romans Point: In Herbster, Wi and is accessible from the Bark Bay State Natural Area boat ramp. It has a few decent caves but without as many crowds. It is a bit more sheltered from the wind and has several public launch locations. The private property owners have ladders leading down the cliff, which makes this the sea cave location with the most extraction points. Must be more than 50 lbs to paddle at Romans Point. Madeline Island: There are about 1/4 as many caves at Madeline as those before it on this list but they are fun caves to paddle and if you look closely you can find one tunnel cave and one underwater cave. The caves won’t be as amazing as Devil’s, Meyers and Sand but it is very protected from a West wind, so a good option for sea cave paddling on a West wind day, which is primarily what we get through the summer months. This location will have more crowds than Romans but a bit fewer than Meyers. 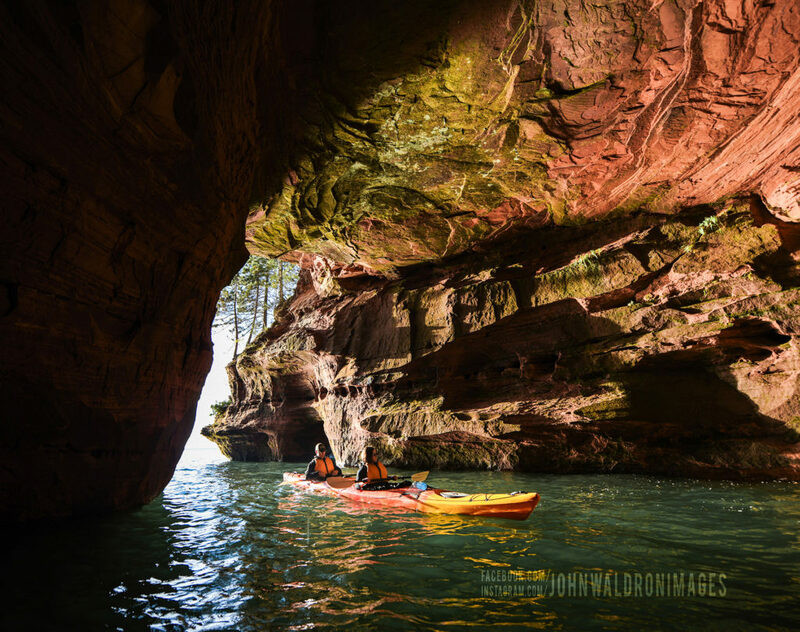 Red Cliff: There are about 1/2 as many caves as Madeline Island but the accessibility and protection from the wind are better than anywhere else in the Apostle Islands. You will experience about the same amount of crowds as Madeline and you almost never see boats going into the caves. The caves are accessible from the Red Cliff Ojibwe Reservation in Red Cliff, Wi and you can put in right at the boat ramp at the casino. There is food and restrooms at the casino and lodging. The rest of the caves: The rest of the caves on the list consist of a few caves at each location and mermaid rocks (sandstone that pops up above the water and looks like a mermaid would like hanging out there).